What should Windows 8 have been? Windows 8 is being called a failure. 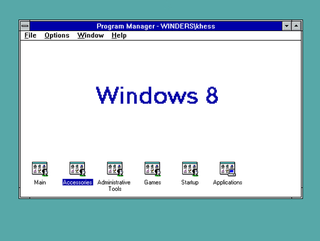 I never liked the direction Microsoft took with 8. It was a radical chase after the iPad market. Why? Windows and I go way back. In college I first bought a Macintosh when I ran into other people in the dorm playing a new game: Wing Commander. Before I knew it I had sold my machine to a Norwegian exchange student and used what little other money I had to buy 386 with 8 megs of RAM and a math co-processor. Within a day I had completely hosed the machine trying to find the right lines to load himem.sys. Reloading Windows 3.1 at tuning it just so was a challenge I was determined to conquer. I got good at it and soon enough i was doing the same for others. I never did get good at Wing Commander. Back then I was helping people play games or have the tools to write papers. Now I help companies run smoothly. I've never seen my job as work -other people do that. I just make it possible. So, when Windows 8 arrived, I was annoyed at how much effort went into making it look pretty rather than increase productivity. It's disorienting and pointless for people who just want to get the job done. In my mind, Windows users produce stuff. They are the makers. No offense Apple fans but, iPads are pretty limited beyond content consumption. I'm not writing to argue that though. I'm angry that Microsoft abandoned their strengths for a market they didn't need. Not this way. There was a time when Apple was the only way to go if you wanted to edit photos or movies. But Windows was doing all that just fine. Apple was fun but Windows was a tool to be used. Whats the message now? What should it have been? It's not too late. But serious work needs to be done.